Q. I have a small spot beside my garage where I started growing tomatoes about ten years ago. After a couple of years I started having trouble with leaf spot. I now remove the diseased leaves as soon as they appear, I’ve installed a heavy weed mat and I use Soap-Shield® fungicidal soap. All of these efforts help, but they don't get rid of the problem. Now the disease has spread to other beds containing impatiens and ground roses. Is there anything I can put on the soil to get rid of this problem? A. 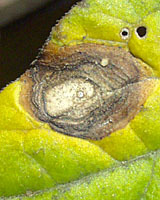 Two diseases commonly infect the leaves of tomatoes wherever they're grown around the world - early blight, at right, and septoria leaf spot, below left. Both contribute to the progressive yellowing and death of leaves beginning at the bottom and proceeding to the top of tomato plants over the course of the growing season - but not ornamental flowers and shrubs such as impatiens and roses. 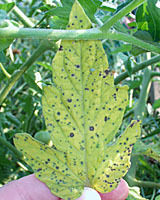 Both diseases survive from year to year on infected tomato plant debris (or closely related weeds such as nightshade, horse nettle, jimson weed, etc.) left in or near the garden at the end of the growing season. Rainfall or irrigation splashes spores from small pieces of infected debris onto the lowest leaves of tomato transplants in May and June, beginning the cycle anew. Neither disease can survive for more than a couple of years without reproducing on tomato plants or their weedy relatives. Therefore, when space allows, the first step in reducing the severity of these diseases is to rotate tomatoes from one spot in the garden to another where they haven't been grown for three or four years. The next step is to create a physical barrier between the soil surface, where small bits of infected plant tissue may linger, and the leaves of the current season's plants. This can be accomplished by planting through holes punched four to five feet apart in several layers of newsprint, light-reflecting plastic, at right, or a six inch-thick layer of weed-free oat straw. As an added benefit, these barriers will slow the rate of moisture evaporation from the soil surrounding the roots of your tomatoes. 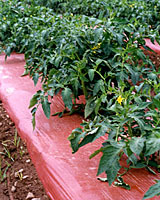 Spacing plants four to five feet apart, left, maximizes light penetration and air circulation between plants. This reduces the length of time leaf surfaces remain wet from an early morning dew or after a thundershower which in turn, reduces the window of opportunity for spores of these diseases to germinate and penetrate leaf surfaces. It may be very hard, psychologically, to grow only three or four tomato plants in a space where you previously planted a dozen or more. Keep in mind, however, that three or four healthy plants may very well produce as many tomatoes as a dozen or more severely infected plants! Expanding on the effort to keep the leaves of your plants as dry as possible, you may want to water when necessary with a soaker hose that will drip water right over the root system. Or, you might want to try an even lower tech technique such as filling half-buried milk jugs with holes punch in their bottom, at right. The water will gradually drip through the holes right onto the root system growing around the jug! Finally, when all else fails, I suppose you can fall back on the application of fungicides (always exactly according to label directions) to reduce the severity of these diseases. One option would be the "organic"-compatible fungicidal soaps such as Soap-Shield® (which you have been using) and/or Concern® Copper Soap Fungicide®. Meanwhile, two synthetic fungicide active ingredients that have been labeled for the management of both diseases for many years are chlorothalonil (Bravo or Daconil) and mancozeb (Dithane, Maneb, etc.). Keep in mind, however, that unless you do your best to manage these diseases culturally, all the fungicide applications in the world aren't going to keep your plants completely disease-free.